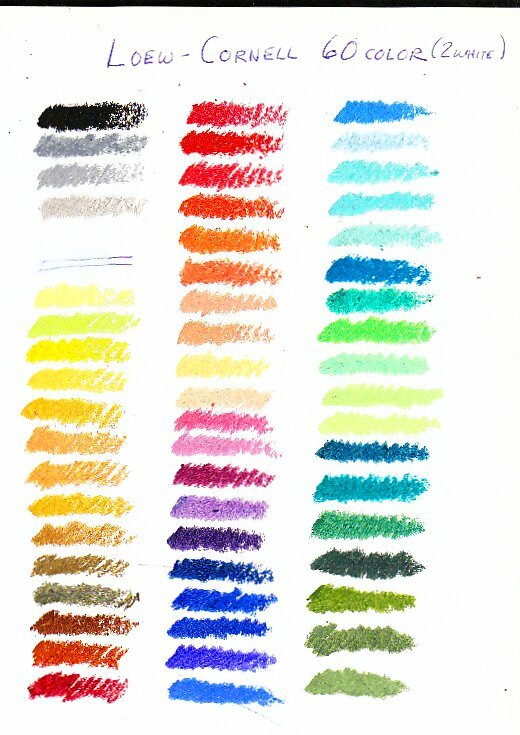 Loew-Cornell oil pastels are small round wrapped sticks available only in sets, in ranges of 12, 24, 36, 60 and 72 sticks. The 60 color set has two white sticks, which I found convenient when there's no open stock to get extras. I bought the 60 color set back in 2004 when I was doing a commission for a friend and then set it aside when I got more into doing colored pencils. 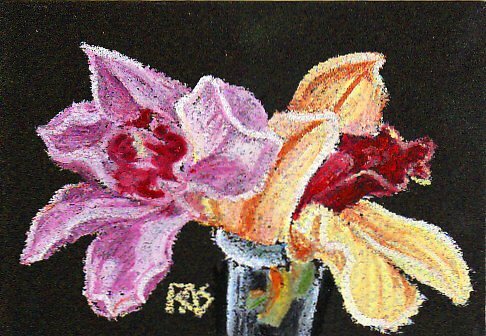 I'd forgotten how pleasantly creamy and soft Loew-Cornell oil pastels are. Their texture isn't far from Erengi and they are good and opaque even if they generate crumbs. It's better to blow the crumbs off than wipe them away, they'll streak easily if wiped because the crumbs are just as soft as the sticks. Or just pick them up gently with a blender and push them back into their appropriate color areas, that works well. They are one of the cheapest brands available. The 72 color set comes in a long wood box with two long rows divided into two areas on each side. The other sets have a styrene tray in a cardboard wrapper with a separate panel of clear plastic that lays over the tray before you slide it into the box. These aren't watersolubles, so they work with odorless turpentine, Bestine rubber cement remover, linseed oil, or any oil painting medium if you want wet effects. Canvas or canvas board is better than paper for that, unless you gesso your paper. I wasn't sure whether I'd recommend them or not, but trying them again after all this time -- their texture and color range is excellent. These are good sketchbook oil pastels and good beginner ones. They have a medium-soft texture, opaque color and good handling quality. The only thing against Loew-Cornell oil pastels is that at that price, lightfastness is probably bad. We'll find out when I conduct my lightfastness tests. If some colors are relatively fadeproof, you may find it advantageous to use these even for sketches you intend to sell as long as you stick to a careful choice of colors and avoid the most fugitive hues. Price at Blick is $5 and change for a set of 50 sticks, at ASW it's under $30 for the wood box set of 72 when it's on sale. Most of that cost is for the box naturally. They are smaller than Gallery, but they are also softer and very creamy.